Ironically, for a person who dislikes traditional breakfast food, brunch could easily pass as my favorite meal. When we were still living in CA, brunch became an almost weekly event. Imagine date night, but better. Considering the fact that I like to be tucked into bed by 9:30PM max, daytime eating and drinking surpasses having to put on makeup and waiting in line for a table. 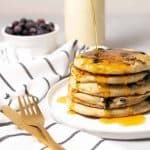 Now that we have settled into our new place, I wanted to recreate the effortless ease of brunch at home. 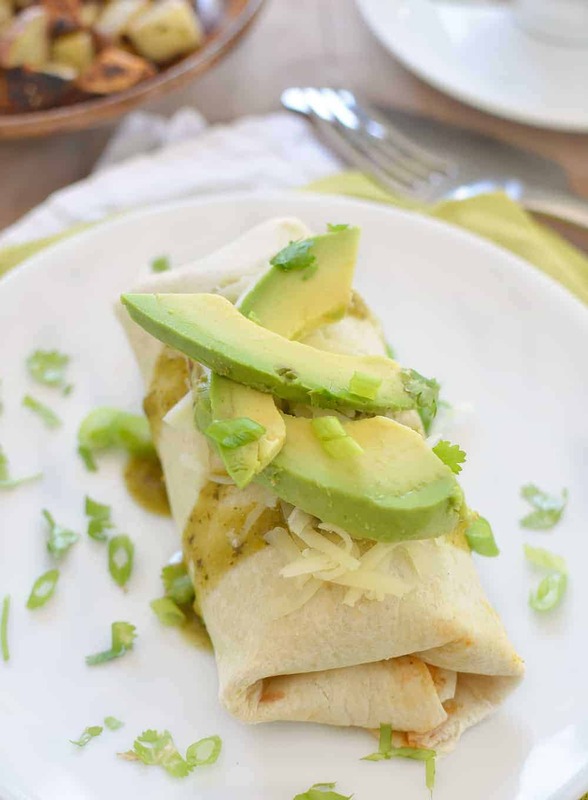 These slow cooker breakfast burritos are the lazy answer to morning bonding. Place everything in the slow cooker at night, cuddle in, and wake up to these comforting southwestern burritos that are ready when you are. Scrambles are one of my favorite ways to enjoy tofu. Crumbled, firm tofu has almost the exact same texture of eggs, and can be cooked for hours without turning rubbery or brown. Therefore, if I want to snuggle under the covers a little while longer, I don’t have to worry about burning this breakfast as a compromise. I tested this one after both 6 hours and 8 hours and each turned out great. If you think you will be sleeping in a little longer, add an extra 1/4 or so of water to the mixture to prevent any burning. While it will be a little more wet, you can use a slotted spoon to drain off any excess liquid before serving. 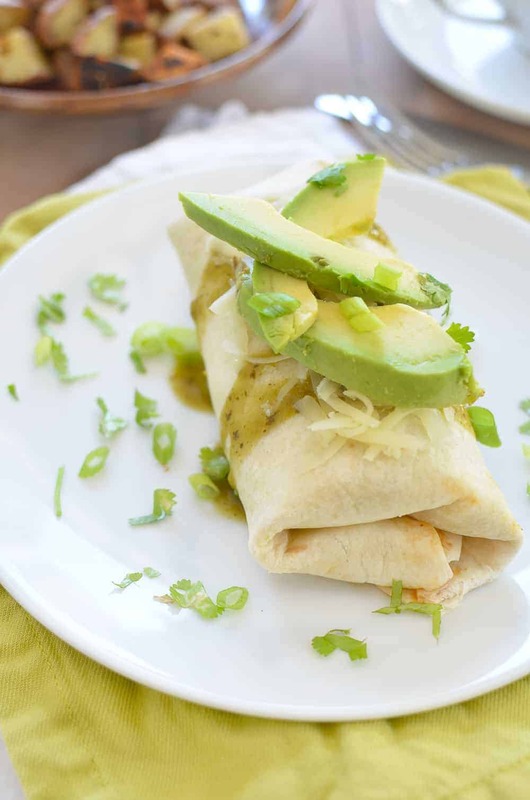 These burritos are perfect for company! We have a jam-packed visitor schedule this fall and I plan on putting a bowl of these on so everyone can help themselves when they’re hungry. While the filling is great as is, I love it wrapped up in a giant burrito! I top with extra cheese, avocado and lots of hot sauce. When ready to serve, stir in the spinach until just wilted. 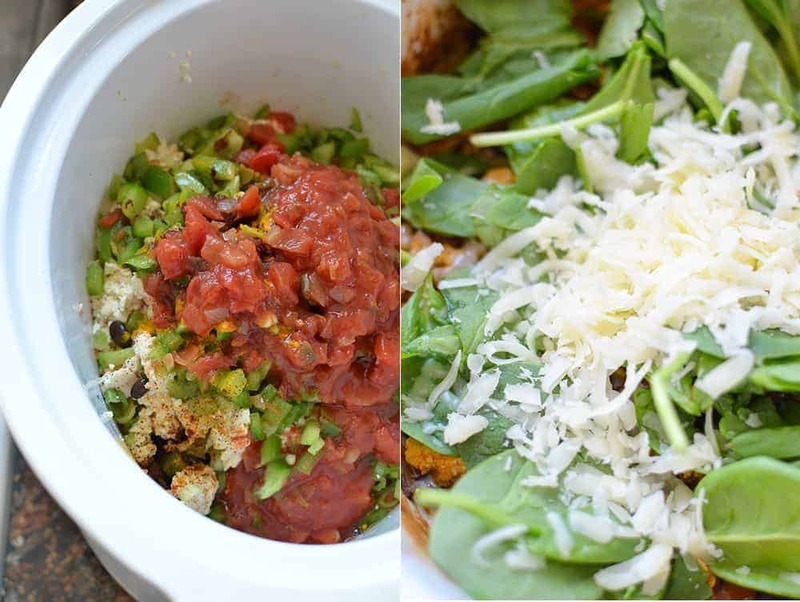 Using a slotted spoon to remove as much extra liquid as possible, place a scoop on the center of a burrito, top with any optional toppings and roll up! 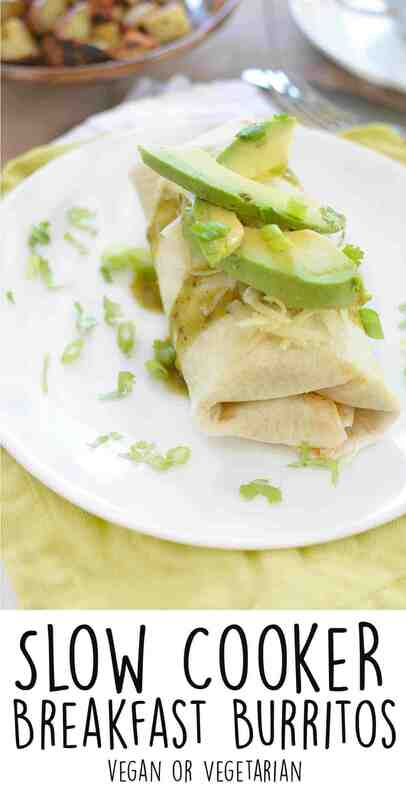 Serve with extra salsa, hot sauce or anything else you like with your breakfast burritos! This one doesn’t overcook, so if you cook it longer than 6 hours, that’s OK. If you plan on cooking it for longer than 6 hours, add few extra tablespoons of water so that it doesn’t burn. I’m so sad I missed you at FNCE! It came and went way too fast! Brunch is certainly the best meal of the day in my opinion! I love lingering over a delicious meal and maybe having a cocktail or two! 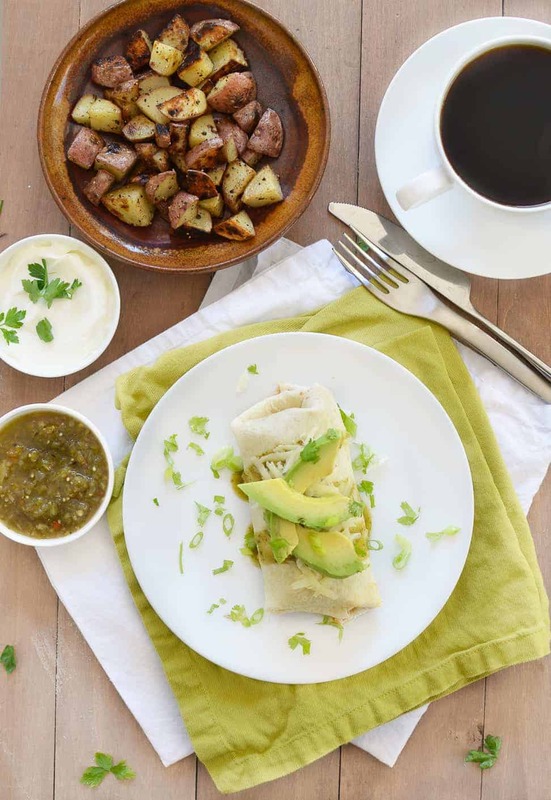 Breakfast burritos are definitely a brunch staple – love your take on them. This is genius! I want breakfast that is ready when I am! You’re a genius. Also, pretty pictures Alex. Burritos are not easy to shoot, lol! I love EVERYTHING about these burritos! 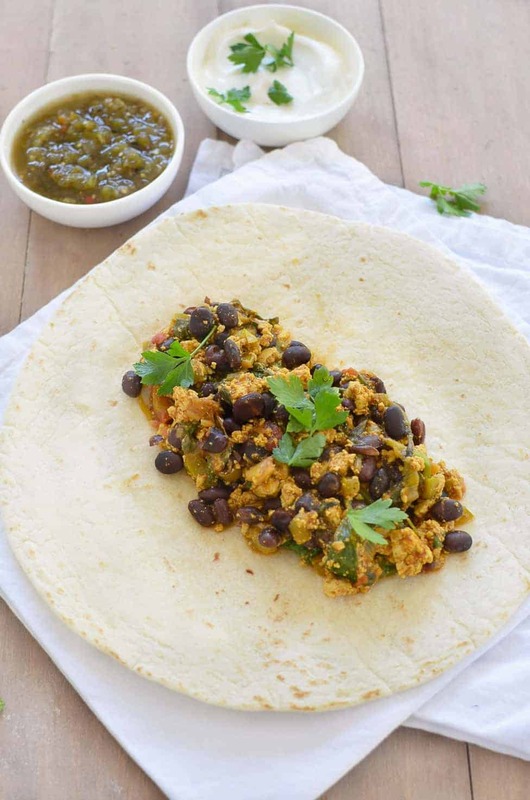 Breakfast burritos rock and your photos are absolutely gorgeous! Hi Greg, thanks for the comment. You can use eggs or omit the tofu if you’d like. Though, my thoughts on tofu aren’t the same. Most of the confusion seems to stem from soy’s phytoestrogen content. It’s true that estrogen has been linked to an increased risk of breast cancer (and other issues), but phytoestrogens are not estrogens and don’t work the same way. Phytoestrogens are naturally-occurring plant compounds that are found in a number of foods, like soy. A series of health benefits can be attributed to consuming phytoestrogens: lowered risk of heart disease, osteoporosis, and yes- even breast cancer. We see this most notably in traditional Asian diets, which have high soy intake but low rates of cardiovascular disease, diabetes and breast cancer. Digging a little deeper, we find that isoflavones, a class of phytoestrogens, can block other estrogens from binding to estrogen receptors, therefore reducing excess estrogen where it isn’t needed. This mechanism helps to explain why women who consume the most soy isoflavones have a lower risk of breast and other hormone dependent cancers. While studies do show mixed results on the potency and amount of soy needed for breast cancer reduction, it doesn’t seem to be harmful. Some studies suggest the effect of soy on breast cancer risk is most beneficial when consumed at an early age, when breast tissue is still developing. Very well said I love tofu, and unfortunately a lot of people misunderstand it because of the word estrogen. Can’t wait to try this recipe! 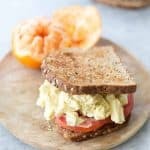 If I decide to use eggs, should I scramble them first then use the recipe where the tofu is used? Hi Kayla, I’m not sure how the eggs would work, though I would recommend scrambling them before placing into the slow-cooker. 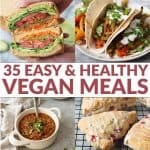 I would recommend adding them later, the tofu can stand up to the long cooking process, but I would worry that they eggs would dry out if left too long.